12:30 am. Once in his room, he went to sleep." Once again, at the very least, we are forced to ask ourselves how and why a young man could have kept such important information to himself for so many years. We must consider that Michael might have become aware of John's (and others) testimony about someone coming in and out of the house. This could have been what prompted him to come forth with his confession. This possibility, of course, does not inherently mean Michael murdered Martha. Michael may very well be telling the truth now. 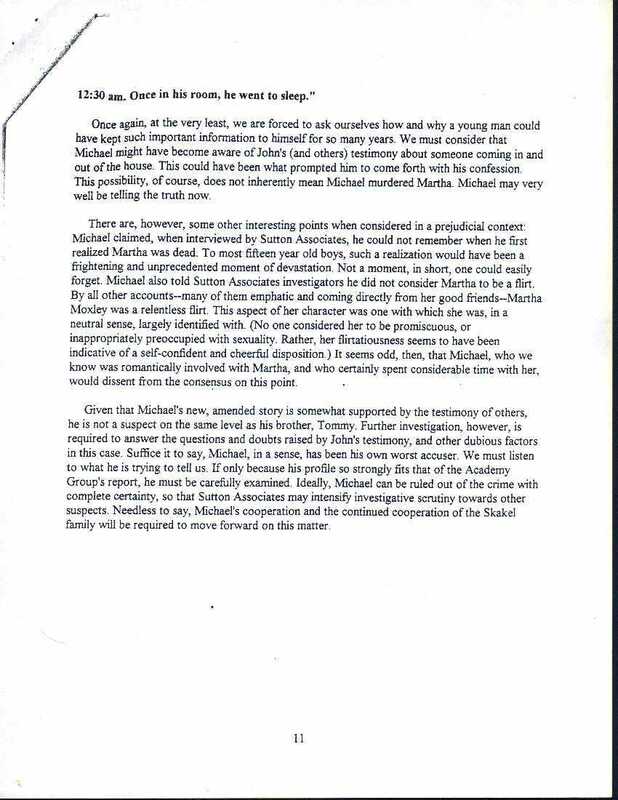 There are, however, some other interesting points when considered in a prejudicial context: Michael claimed, when interviewed by Sutton Associates, he could not remember when he first realized Martha was dead. To most fifteen year old boys, such a realization would have been a frightening and unprecedented moment of devastation. Not a moment, in short, one could easily forget. Michael also told Sutton Associates he did not consider Martha to be a flirt. By all other accounts--many of them emphatic and coming directly from her good friends--Martha Moxley was a relentless flirt. This aspect of her character was one with which she was, in a neutral sense, largely identified with. (No one considered her to be promiscuous, or inappropriately preoccupied with sexuality. Rather, her flirtatiousness seems to have been indicative of a self-confident and cheerful disposition.) It seems odd, then, that Michael, who we know was romantically involved with Martha, and who certainly spent considerable time with her, would dissent from the consensus on this point. Given that Michael's new, amended story is somewhat supported by the testimony of others, he is not a suspect on the same level as his brother, Tommy. Further investigation, however, is required to answer the questions and doubts raised by John's testimony, and other dubious factors in this case. Suffice it to say, Michael, in a sense, has been his own worst accuser. We must listen to what he is trying to tell us. If only because his profile so strongly fits that of the Academy Group's report, he must be carefully examined. Ideally, Michael can be ruled out of the crime with complete certainty, so that Sutton Associates may intensify investigative scrutiny towards other suspects. Needless to say, Michael's cooperation and the continued cooperation of the Skakel family will be required to move forward on this matter.